Homeopathy is an alternative therapy based on the theory that "like cures like" and was developed in the late eighteenth century by a German doctor named Samuel Hahnemann. Hahnemann believed that if a large amount of a particular drug or substance caused symptoms of a disease, a smaller dose might reduce the symptoms by enhancing the body's natural response to illness. Homeopathic medicines contain a single active ingredient that supposedly induces the symptoms to be cured, but this ingredient is substantially diluted. Homeopathy remains controversial, and the studies performed on it have been inconclusive. Since homeopathic drugs are so diluted, health experts suggest that they are probably safe to take-as long as people don't use them in place of necessary medical care. Homeopathy is famous for finding out the root cause of the disease. Therefore, homeopathy plays an important role in the management of many deep-rooted and chronic diseases such as Diabetes. It is clear that diabetes cannot be cured completely but can be controlled effectively. It is found that people with diabetes can lead a healthy life if their blood glucose level is under control. The homeopathic diabetes control remedies are given according to the symptoms of the individual person with diabetes disorder. There are many homeopathic remedies according to the symptoms and requirement of the diabetic person. If you don't want to be dependent on insulin injection, do try the alternative medicine area of homeopathy treatment for natural control of diabetes mellitus. The method of diabetes treatment by homeopathic remedies is best achieved by dietary control, an active regular lifestyle and adopting the natural method of treating diabetes with full belief. Homeopathic medicines help in maintaining the levels of sugar, protein and fat metabolism and also help in preventing further progress and hence complications of the disease. It effectively reduces the risks associated with the disease to the bare minimum. Strict restrictions in diet and regular exercising, especially jogging or walking, are a must in diabetes management. In diabetes, people suffer from obesity, blood pressure etc. This can also be cured using homeopathic medication. The further complications that are caused due to diabetes can also be overcome using homeopathy. The disease should be treated using homeopathy in the initial stages to get the effective results. Non-healing diabetic ulcers can also be cured using homeopathy. In older people, sometimes, the medicines stop working and they have to go for stronger medications. In such cases, constitutional homoeopathic remedies can be used to obtain effective results. 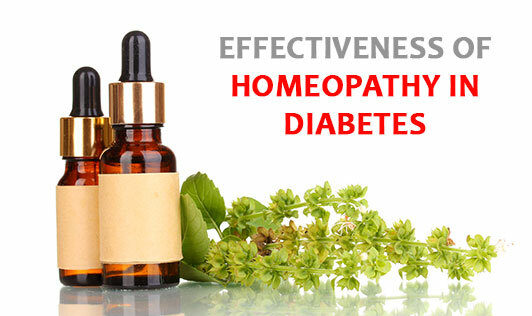 Homeopathy improves the life of a diabetic patient to a greater extent.